Informed Whey is, quite simply, the UK's very best whey protein shake. It uses unrivalled amounts of the purest protein and amino acids, and combines them with gourmet taste and rigorous independent banned substance testing. Informed Whey is totally transparent – the exact quantity of each ingredient is declared, as opposed to hiding behind proprietary blends where ingredient amounts are indeterminable. After all, you deserve to know exactly what you are putting into your body. Informed Whey delivers over 24g protein per serving via its mTOR Whey Complex, contributing to growth in muscle mass. This equates to a market-leading 81% protein content, when compared to other brands. The mTOR Whey Complex consists of ultra and micro-filtered Pure Whey Isolate 90, which is included as the primary protein source. This has been combined with undenatured Pure Whey Protein, in an impressive 65/35 ratio. In addition, pharmaceutical grade Leucine has been included at an unrivalled 3g per serving. An optimal 3g Glutamine Peptides have also been incorporated; Glutamine levels are often depleted during intense exercise. Finally, DigeZyme, a unique enzyme complex, and LactoSpore, a premium probiotic, have been added to ensure that Informed Whey meets its promise of being the UK’s very best whey protein. Mix 1 level scoop (30g), with 200ml of water or skimmed milk and shake well in a shaker bottle. Consume 2-3 servings per day, one of which should be immediately after training or exercise. mTOR Whey Complex (Whey Protein Isolate (Milk), Whey Protein Concentrate (Milk), Leucine), Glutamine Peptides (Gluten), Fat Reduced Cocoa Powder, Flavouring, Instantising Agent (Soya Lecithin), Thickener (Xanthan Gum), DigeZyme Enzyme Complex (Amylase, Protease, Cellulase, Lactase, Lipase), Sweetener (Sucralose), LactoSpore (Bacillus Cogaulans). 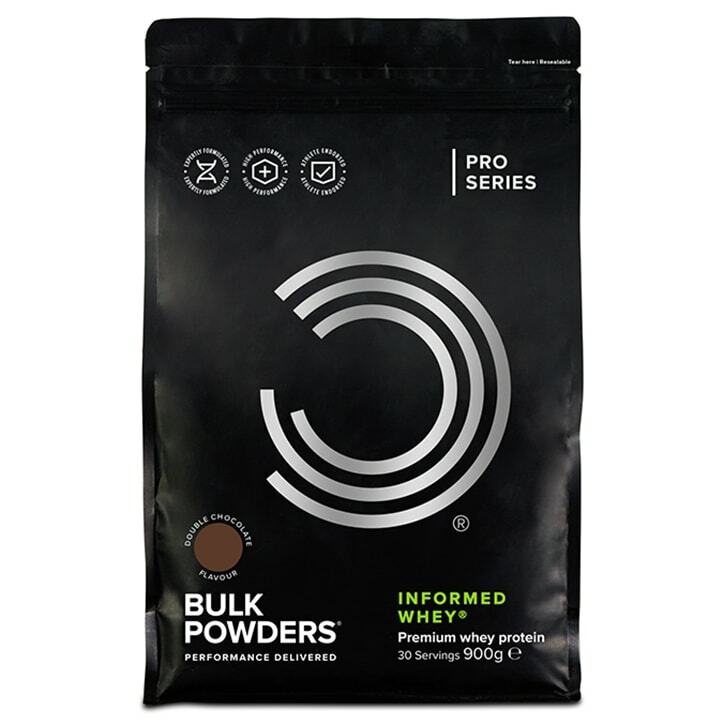 Bulk Powders Informed Whey Double Chocolate is rated 5.0 out of 5 by 2. Rated 5 out of 5 by BobbyD1978 from Proper chocolatey I've bought this stuff before from bulk, but saw it in holland and barrett at the weekend and picked it up. This shake tastes good, has great protein content and digests really easily, so no bloating after the gym.